'I want to break free', as Freddie Mercury once said and don't we all, eh kids? Apart from George Michael, that is, who doesn't want your freedom but that's a whole different story. 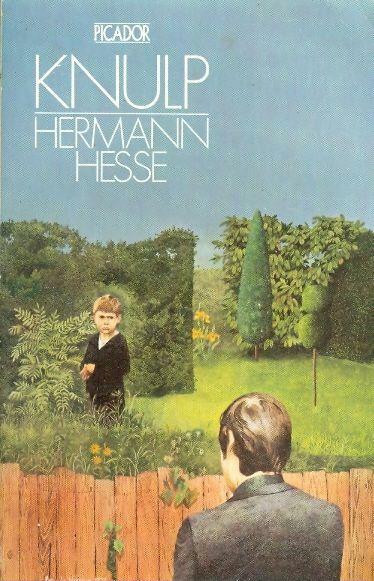 Knulp, by Hermann Hesse is a meditation on the subject of freedom; of what it might mean and of the consequences of pursuing it. Does being free mean being fulfilled? Does freedom bring happiness? Is freedom in itself a large enough reward for what might be lost in gaining it? Hesse's genius was in the way he was able to ponder such questions and convey meaningfulness through beautifully written stories. He's one of my most favourite writers. First published in 1915, Knulp is the story of a young German tramp who has opted to drop out of society; not through misfortune or misadventure but through choice. He spends his days wandering from village to village, always being offered food and a place to lay his head by strangers and old friends alike. Men enjoy his company and women love him. Knulp is seemingly a happy soul. We learn that he was once a model student and if he had only continued with his studies could have become a great man and achieved great things. When he views the lives of those who have married, worked and built worlds around themselves - though he holds them no malice - he knows that this simply isn't for him. Knulp, however, is a haunted man and reveals this during conversations with old friends and fellow tramps. He recognises a loneliness within himself and though he sees it in other men too, within him it is much more acute. Come the end of the book, Knulp as a much older man but still a tramp, is dying and has returned to the village where he was born to view it for one last time. For all the roaming he's done, for all the adventure, the singing, the dancing, for all the friends he's made and the girls he's loved; Knulp understands that it was in the days of his childhood that he was the most happy and the most fulfilled. In those days of innocence now long passed, before knowing anything of the world beyond the garden, the woods and the fields in which he played; it was there that he was most free. Knulp heads off to the woods in the mountains to be alone with his thoughts and it's there that he wrestles with the idea that the life he has led has been a botched and futile one. In his thoughts he converses with God who reassures Knulp that whatever happened in his life was good and right, that nothing should have been any different. Moreover, that Knulp was a wanderer in God's name and wherever he went he brought the settled folk a little homesickness for freedom. Knulp is a very beautiful book that deserves to be read at least once and deserves to be contemplated. And on contemplating it you'll realise that the cover painting on the Picador edition as painted by Guernsey artist Peter Le Vasseur, depicting a man looking over into a garden at a boy (or the boy looking over the fence at the man, or just both simply looking at each other?) is brilliant, poignant and perfect.